24 www.seniorshousingbusiness.com Seniors Housing Business n October-November 2017 Hearthside Brookleigh in the Brookhaven area of Atlanta, developed and managed by OneStreet Residential, offers amenities and a lifestyle that are hitting a nerve with older Atlantans who seek communities where they can live their lives doing the same activities as they would in a for-sale home — without the expense and labor that goes along with ownership. By Lynn Peisner Rental homes experiencing the strongest demand among able-bodied adults who are age 55 or older go by a lot of names. Call them age- targeted, age-restricted, 55-plus or active adult. Just don't call them independent living. Multifamily communities that offer ameni- ties and social programming, but no services, to persons either age 55 or 62 and older are all the rage at the moment. And the product is in short supply, so developers are pouring into the active-adult sector. 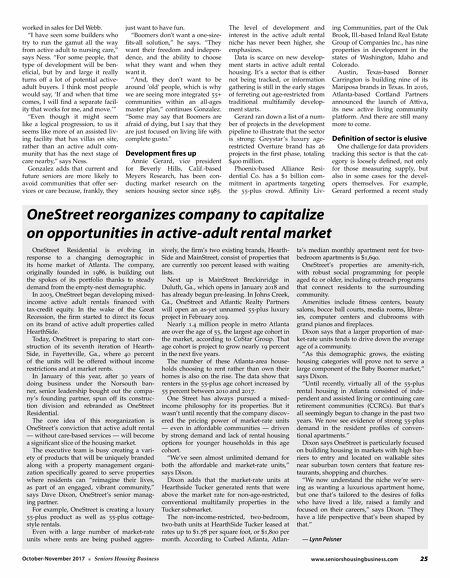 "When you look at the housing market for 55-plus, what you do not see today is rental housing: purely conventionally financed, mar- ket-rate rental housing that is age-restricted and that is not independent living," says David Dixon, senior managing partner at Atlanta- based OneStreet Residential. Independent living properties typically include services such as communal dining, housekeeping, transportation, emergency call systems and social programming services in the monthly fees. Two cultural developments make up most of the wind behind the emerging active-adult rental sector: changing perceptions about rent- ing apartments and changing perceptions about aging. "As long as adults are still 'active,' most don't want to think about the possibility of needing skilled nursing, nor do they want to live in the same community as those who do," says Manny Gonzalez, KTGY Architecture + Planning principal. "They would rather cross that bridge if and when the time does come for it. They just want to keep active and have fun." Most of the Baby Boomers, a group that coincidentally also includes a large percent- age of seniors housing executives, concede that if faced with the decision to move from their home to an apartment, the chances of choosing housing that is connected to "seniors" is very slim, unless there is a physical or mental need to do so. 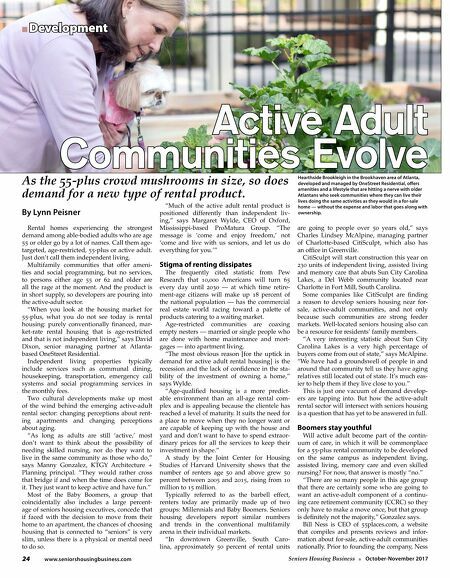 "Much of the active adult rental product is positioned differently than independent liv- ing," says Margaret Wylde, CEO of Oxford, Mississippi-based ProMatura Group. "The message is 'come and enjoy freedom,' not 'come and live with us seniors, and let us do everything for you.'" Stigma of renting dissipates The frequently cited statistic from Pew Research that 10,000 Americans will turn 65 every day until 2030 — at which time retire- ment-age citizens will make up 18 percent of the national population — has the commercial real estate world racing toward a palette of products catering to a waiting market. Age-restricted communities are coaxing empty nesters — married or single people who are done with home maintenance and mort- gages — into apartment living. "The most obvious reason [for the uptick in demand for active adult rental housing] is the recession and the lack of confidence in the sta- bility of the investment of owning a home," says Wylde. "Age-qualified housing is a more predict- able environment than an all-age rental com- plex and is appealing because the clientele has reached a level of maturity. It suits the need for a place to move when they no longer want or are capable of keeping up with the house and yard and don't want to have to spend extraor- dinary prices for all the services to keep their investment in shape." A study by the Joint Center for Housing Studies of Harvard University shows that the number of renters age 50 and above grew 50 percent between 2005 and 2015, rising from 10 million to 15 million. Typically referred to as the barbell effect, renters today are primarily made up of two groups: Millennials and Baby Boomers. Seniors housing developers report similar numbers and trends in the conventional multifamily arena in their individual markets. "In downtown Greenville, South Caro- lina, approximately 50 percent of rental units are going to people over 50 years old," says Charles Lindsey McAlpine, managing partner of Charlotte-based CitiSculpt, which also has an office in Greenville. CitiSculpt will start construction this year on 230 units of independent living, assisted living and memory care that abuts Sun City Carolina Lakes, a Del Webb community located near Charlotte in Fort Mill, South Carolina. Some companies like CitiSculpt are finding a reason to develop seniors housing near for- sale, active-adult communities, and not only because such communities are strong feeder markets. Well-located seniors housing also can be a resource for residents' family members. "A very interesting statistic about Sun City Carolina Lakes is a very high percentage of buyers come from out of state," says McAlpine. "We have had a groundswell of people in and around that community tell us they have aging relatives still located out of state. It's much eas- ier to help them if they live close to you." This is just one vacuum of demand develop- ers are tapping into. But how the active-adult rental sector will intersect with seniors housing is a question that has yet to be answered in full. Boomers stay youthful Will active adult become part of the contin- uum of care, in which it will be commonplace for a 55-plus rental community to be developed on the same campus as independent living, assisted living, memory care and even skilled nursing? For now, that answer is mostly "no." "There are so many people in this age group that there are certainly some who are going to want an active-adult component of a continu- ing care retirement community (CCRC) so they only have to make a move once, but that group is definitely not the majority," Gonzalez says. Bill Ness is CEO of 55places.com, a website that compiles and presents reviews and infor- mation about for-sale, active-adult communities nationally. Prior to founding the company, Ness Active Adult Communities Evolve n Development As the 55-plus crowd mushrooms in size, so does demand for a new type of rental product.